I am conducting simulation studies of LGC, and I found that the improper solution rates were pretty high in my model (If a solution with any variance of growth factor less than 0 or any correlation out of [-1, 1], I defined it as improper. 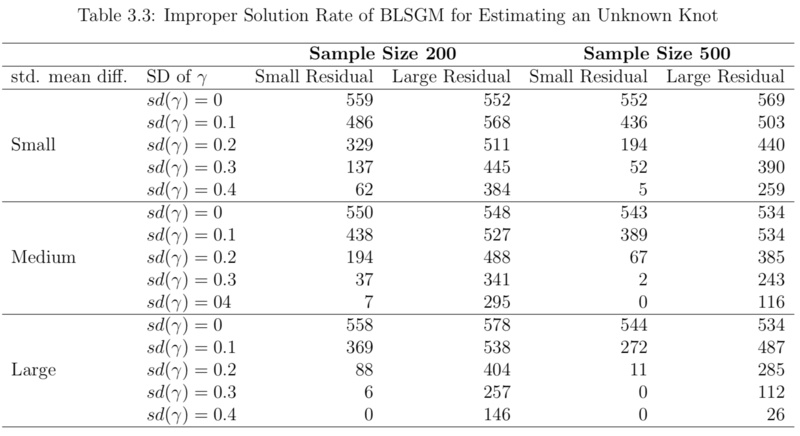 Attached is the number of improper solutions out of 1000 replications). I am wondering when specifying an LGC in OpenMx, should I add constraints on variance or correlations? Or I can just exclude those improper solutions from simulation studies simply? That's really up to you. Whichever option you choose, you need to be able to justify it to your reader/audience. There are good reasons to avoid putting unnecessary constraints on your parameter estimates, but those reasons may not apply to your simulation study. On the other hand, it's a waste of computer time to run replications that give you results you're going to throw away afterwards, and there's something to be said for ensuring that each replication in your simulation gives you interpretable point estimates.